Little Billie didn’t want to go back into the cage on her own this evening and I noticed that for the first time, a couple of the Original Six were looking out for her and leading her away from any skirmishes over the food. They left the Young Ones finishing off the wheat and went over to a tree that they don’t normally roost in. One by one, they perched on a rock, flew onto a fallen branch that was about 1.5m off the ground then flew up onto a low branch on the tree which was about 3.5m off the ground. They then ran up a large sloping branch and flew up onto a perch. When Billie flapped up onto the fallen branch, I held my breath, stood still and watched. After a little bit of grooming, she made her frantic, ungainly but ultimately successful first real flight onto the tree branch. This was going to be her first night roosting in a tree, so I closed and locked the cage. 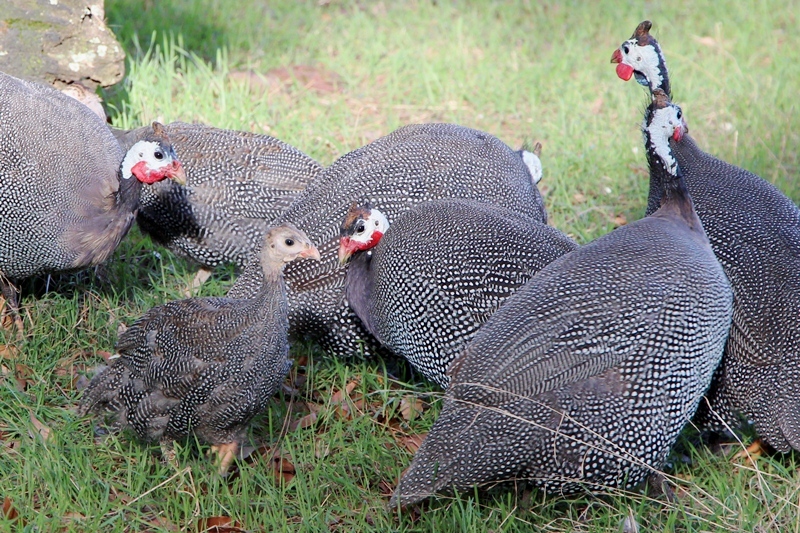 I was quite touched to have witnessed such a display of care and teaching from the Guineas. They are routinely dismissed as terrible mothers, but having spent time observing them, I think they are just misunderstood. Over the weekend, they were coming to the house in the morning and making a fair bit of noise. They were back again this morning and I realised that they hadn’t come over yesterday when I had let the Littlies out at 6.30am and realised they were coming over to alert me to the fact that they were missing part of their flock. I went over to let them out at 9am and the flock came with me to collect their buddy. Definitely misunderstood.